'Jon & Kate Plus 8' plus one? Dating coach: "You need to take a little time off from dating"
(CNN) -- Just three weeks after Jon and Kate Gosselin announced their separation, there is speculation of a new plus-one in the mix for "Jon & Kate Plus 8." 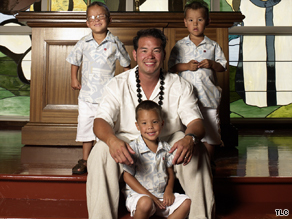 Jon Gosselin, here with his sons, was photographed on vacation with another woman. Fans of the show are buzzing about photos of Jon Gosselin apparently on vacation in Saint-Tropez, France, with a young woman who is definitely not his wife and reality TV co-star. People.com identified her as Hailey Glassman, the daughter of Dr. Lawrence Glassman, a surgeon who famously performed a tummy tuck on Kate that was documented for the Gosselins' hit TLC show. Gosselin and Glassman appeared to be the guests of designer Christian Audigier, creator of the Ed Hardy line, and the pair was spotted holding hands, smoking together and lounging aboard Audigier's yacht. The Gosselins' marriage became the focus of their reality show -- which had followed the adventures of the pair raising a set of twins and sextuplets -- amid allegations that Jon was cheating on Kate with 23-year-old teacher Deanna Hummel. Jon repeatedly denied that he had strayed. But after much speculation and tension on the show, the couple announced in June that they had separated. The same day, Kate filed for divorce. Given the media spotlight, dating coach Patti Feinstein said, it's not a good idea for Gosselin to be out with another woman so soon after the marital rift. "You need to take a little time off from dating, because there is this rebound period," Feinstein said. "He's probably feeling that he wasn't getting enough attention from his wife, so he's all lonely, and he needs to be stroked up. "Once he gets the feeling that 'I'm loveable; I'm worthy; someone loves me for me and wants to put me first,' " Feinstein theorized, "then that person he is dating, either he will dump her, or she will dump him." Relationship expert Nancy Slotnick said the unfortunate ones in the high-profile tabloid fodder are the Gosselin children: 8-year-old twins Cara and Mady and 5-year-old sextuplets Aaden, Collin, Joel, Alexis, Hannah and Leah. "Their whole TV show is based on them being parents and caring for all of these kids they have, and both of them seem totally wrapped up in themselves," Slotnick said. "It's strange that [Jon] feels like he has to deny the whole thing, then at the same time he is flaunting it." Psychotherapist M. Gary Neuman advises that parents should wait about a year after a separation before introducing a relationship to their children. "Children need about a year at least to adjust to the new sense of family and to develop individual relationships with each parent," said Neuman, the author of "Helping Your Kids Cope With Divorce the Sandcastles Way." "When Dad has a girlfriend, then kids can see that as an intrusion on their time and their situation." Neuman, whose Sandcastles program for children of divorce is mandatory through the court system in several states, said children go through a great deal of emotional turmoil in the wake of a broken marriage. Couples should wait at least six months to even let their kids know that they are actively dating, Neuman said. "It is hurtful to children to think that their parents are dating when it is done so soon after a separation," Neuman said. "Because what it says is that it is minimizing the marriage, and the marriage is crucial to children because they came from this union, and they want to know that their parents were in love when [the children] were born. "The idea that there could be such a quick move to dating that the children are aware of could devalue their parents' relationship and therefore themselves." Neuman noted that parents going through a divorce can date privately but said they should also consider counseling before entering another serious relationship to guard against the high divorce rate for second marriages. Jon Gosselin hasn't commented on the seriousness of his apparent relationship or even confirmed that it is a relationship. He told People that he felt "very relaxed" during his time away, though he added: "I keep thinking about the kids and missing them."